I know colouring-in isn't looked upon as a very creative activity, but I find it and doodling quite soothing. I also find that if I have a creative problem to solve mentally, giving my hands something uncomplicated to do can release the answer to a problem. I went through an intense colouring stage as a child, and particularly loved to colour mandalas. Do you know them? They're usually circular, often geometric, and used in Hinduism, Buddhism and other religions as an aid to meditation. 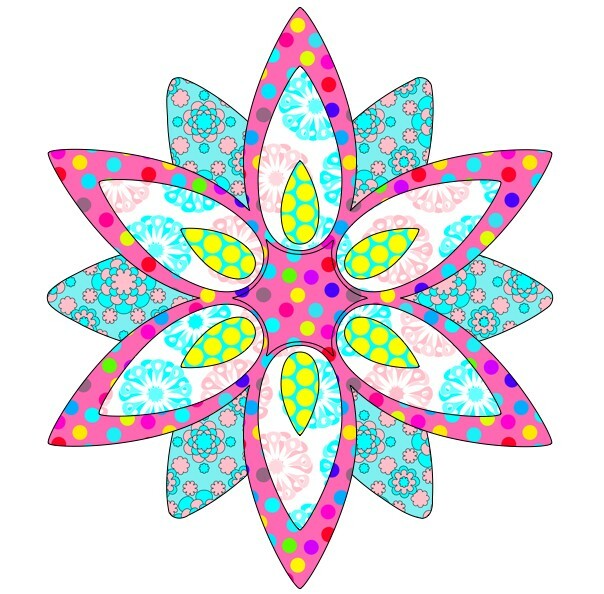 The Mandala Project has a gallery of stunning mandalas created by others for us to enjoy. This is not just colouring in - there is some stunning art work there to appreciate. The Mandala Project models might inspire your kids to try creating their own mandalas. Make Your Own Mandala has some simple directions if you're not sure where to start. Or kids might like to play with a digital version I found at GirlsGoTech. It's a simple matter of dragging geometric shapes into position on your workspace. You can see the one I created there above. Another great place to colour mandalas is Scrap Coloring which I wrote about in my article, Scrap Coloring (so innovative with these posts titles!) I love the opportunity this website gives us to fill shapes digitally with pattern and colour. 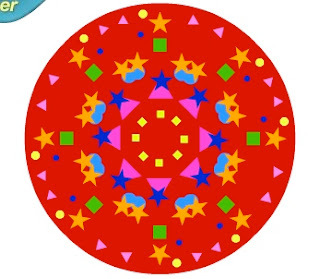 The mandala I coloured on their template is the lower image on this post. Find other art-related posts on The Book Chook via the Art tag. I find that coloring is one of those activities that kids (and adults) of all ages enjoy. I think you are right, it unlocks our abiltiy to be creative. Love the digital version! I still love colouring in too. I sometimes hijack my kids homework so I can "help"
That last one is gorgeous!!! Thanks for the links. Scrap Coloring is a great site, and well worth exploring with your kids, Kelly. Perfect for a rainy afternoon!